Now is the time to update your bathroom. We are your complete remodeler. Even if you need to remove a few walls or add a complete new wing, we will help you create a beautiful new living space. Frameless shower door surrounds this Carrara Italian marble shower. Carrara Italian marble covers the walls and floor. Ornate trim work, marble sink, and towel warmer finish this elegant bathroom. Colonial Master Bath with Granite sink top. Colonial Master Bath Marble Shower. 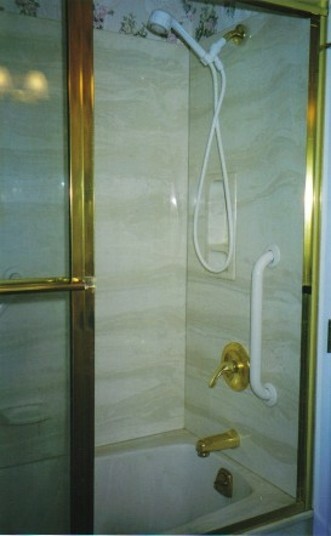 Marble Shower with built-in shelf. Colonial Powder Room with Carrara Marble walls and floor. Sliding Shower Door with chrome trim. Granite sink top with vanity. Carrara porcelain tile with Parisian Blue glass accent tile. Parisian Blue glass tile shower niche. Blue Pearl granite vanity top and floor. Cultured marble sink top and white vanity give a clean, fresh appearance to this Colonial upstairs hallway bathroom. Custom tile work with navy blue stripe. Pedestal sink gives an elegant look to this Colonial powder room. 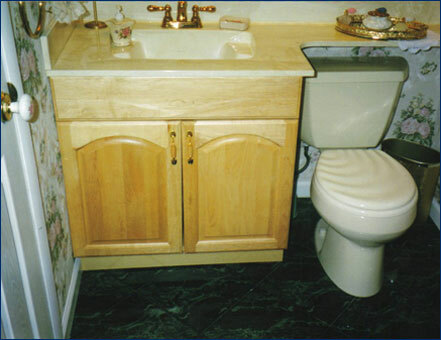 This space saving pedestal sink and ceramic tile floor is a great update for this Cape Cod style bathroom. Beautiful cultured marble sink top with natural maple vanity brings lightness and added counter space to this bathroom. Beautiful, cultured marble tub surround, gives a clean look to this bathroom.